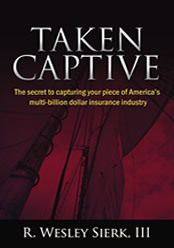 Taken Captive author Wesley Sierk is one of only 43 people in the world who have attained the Associate in Captive Insurance (ACI) designation. R. Wesley Sierk, III is the President and Lead Strategist for Risk Management Advisors, Inc. He is an expert in executive compensation, corporate benefit planning, alternative risk transfer, and captive insurance formation and management. Sierk has more than 14 years experience helping highly profitable, closely-held businesses limit their risk exposure and taxes through qualified plan structures, onshore and off-shore entities, and trust arrangements.He works primarily with homebuilders, manufacturing companies, real estate developers, and sports and entertainment professionals. Sierk has been recognized as a Chartered Financial Consultant (ChFC) and a Chartered Life Underwriter by the American College since 1996. He was awarded the designation of CRIS (Construction Risk and Insurance Specialist) in 2006. He is one of 43 people in the world who have attained the Associate in Captive Insurance (ACI) designation. Sierk is a frequent speaker to industry associations as well as law and CPA firms on asset protection and how ordinary businesses can escape the hard/soft market of insurance by creating their own closely-held insurance companies. He has been interviewed for his insight on insurance issues by many publications including The Los Angeles Times, Builder / Architect magazine, and the National Association of Homebuilders. He currently serves as an advisor to the United States Congress for issues that affect the financial well-being of young entrepreneurs and their businesses. Sierk has published many articles in trade publications including Construction Today, Builders Exchange and the Journal of Construction Accounting and Taxation. In addition to receiving numerous industry awards and frequently qualifying for the Top of the Table, his professional memberships include American Society of Pension Professionals & Actuaries, Associations for Advanced Life Underwriters, and the International Forum.